London Festival Opera has a wealth of experience creating the perfect operatic entertainment for a wide range of corporate events, providing the ideal entertainment for a conference, award ceremony or product launch. The programme can include celebrated arias from the world of opera, operetta and musicals, with the artists appearing in glamorous modern evening dress or in stunning period costume for an added visual impact. We can arrange a performance for a large-scale gathering or an intimate dinner party, working with you to create the perfect programme and include any special requests. You might consider including a favourite aria chosen by the guest of honour. Opera is about passion and drama, but there are also many lighter moments. Audience interaction can be a wonderful way to entertain your guests – Carmen can serenade the guest of honour and give them flowers as she does in the celebrated ‘Habanera’ and Figaro, the ‘Barber of Seville’, can interact with the audience in his famous aria. Our performances for corporate and special events can take the form of an opera gala, or ‘A Night at the Opera’, which includes celebrated arias and ensembles from the great operas of Mozart, Verdi, Rossini, Bizet, and Puccini, making the perfect enhancement for a corporate dinner or reception. Alternatively, you might like to present a highlight performance in costume of a specific opera such as ‘La Traviata’, ‘Carmen’, ‘The Magic Flute’ or ‘Madame Butterfly’. We also present seasonal performances in the form of ‘A Christmas Night at the Opera’ which could provide a wonderful entertainment for your Christmas party! Accompaniment can be solo piano, a small instrumental ensemble or orchestral backing tracks. The performance can be presented at the beginning of the event during a drinks reception, or at the end of the evening as a ‘finale’. Alternatively, the performance can be linked with a dinner and presented in two or three sections dovetailed between the dinner courses. A ‘Surprise Start’ can work particularly well for a corporate event: our opera singers initially appear to be waiters or fellow party guests, who subsequently burst into song to the amazement of the audience. This is an innovative and wonderful way to add an extra element of fun to a party or reception. Please see our page on ‘Singing Waiters’ for more details. Please call us to discuss the many options available and the specific requirements of your event. 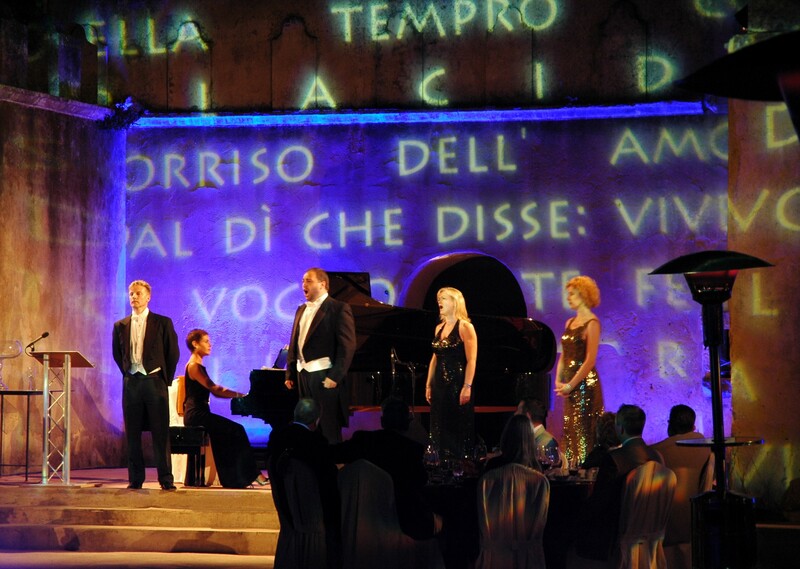 We have many years’ experience of presenting opera of the highest calibre for special events and we are here to help! London Festival Opera has presented performance for many leading corporations and organisations in the UK and overseas including: Arthur Andersen; AXA Sunlife; Bank of New York; Brocket Hall; BMI Healthcare; Cavalry & Guard’s Club; Cunard; The Daily Mail; Deloitte & Touche Consulting Group; Deutsche Bank; The Drapers’ Company; Freshfields; The Goring Hotel; The Goldsmiths’ Company; Goldman Sachs International; Hermes; J P Morgan; The Ironmongers’ Company; McKinsey & Co; PC World; Lafarge; Le Pont de la Tour; Price Waterhouse and Rothschild’s Trust Corporation.